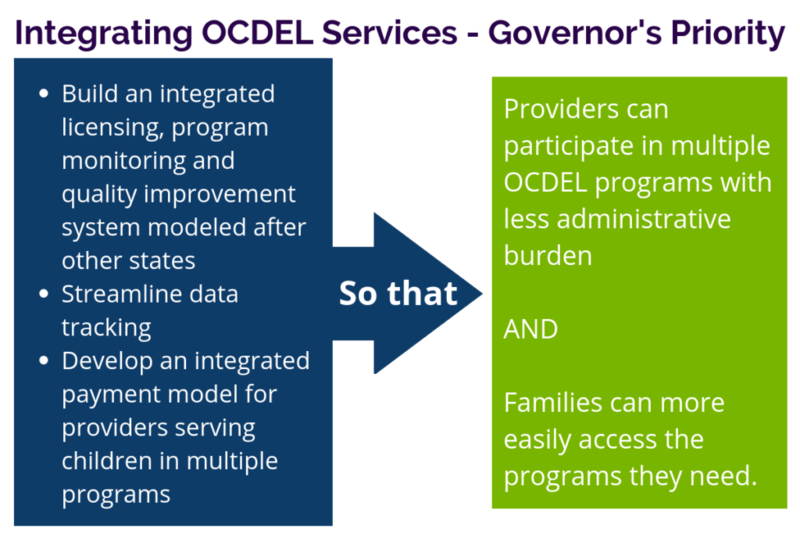 Connecting OCDEL programs so it’s easier for providers to participate and for families to access them. With the creation of the Office of Child Development and Early Learning, Pennsylvania planted many seeds such as Keystone STARS, Head Start Supplemental Assistance Program, Pennsylvania Pre-K Counts, and Maternal Infant Early Childhood Home Visiting grants. Each grew with high quality, accountability, and positive outcomes for children in mind. In the flurry, we may have created unnecessary burdens for programs offering OCDEL’s services and families receiving these services. Pennsylvania has a unique opportunity now to move to a more aligned system, where there is less administrative burden for our providers and it’s easier for our families to access the services they need. Review a summary of feedback from providers and stakeholders on what integrating services means to them. Download the logic model and select recommendations. As a way of gathering your feedback, as you go about your work serving providers and families, an email address has been created for use like a “suggestion box”. If you have a comment or suggestion, related to integrating or improving services, you can send it to RA-PWOCDELInServices@pa.gov. If you have specific examples where our programs could coordinate better, or reduce duplication of effort, please share those examples. All comments and suggestions will be considered, however, responses will not be provided for every email received.